Whether you want to launch a new product, celebrate your big day in style, or throw a party you will never forget Windsor Marquees covers it all and with four separate standard packages to accommodate groups of up to 200 people you really will be able to tailor your event to your needs. Even if you need to fit in a few more clients or distant family members you could even enquire about connecting marquees to add that vital extra space. So don’t let your choice of venue limit your choice of location, instead just bring your choice of venue to your choice of location and choose to use a Marquee for your next event. In next to no time you could soon be sipping champagne under the shelter of glorious ivory drapes surrounded by the greenery of the Forest of Dean. 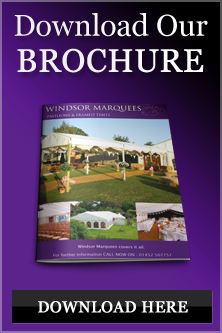 Windsor Marquees has supplied events throughout Gloucestershire and Worcestershire since 1996 so if you are struggling for inspiration and would like a hand in choosing a suitable location don’t hesitate to ask for a nudge in the right direction and start dreaming up your very own event. For further information on the packages we offer feel free to visit the rest of the site or contact us on 01452 507757.